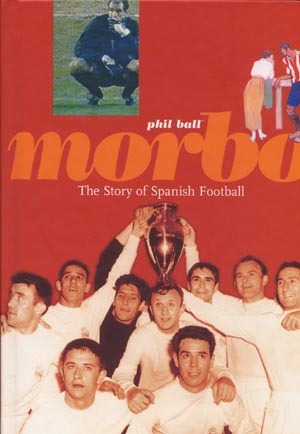 Brit expatriate journalist Phil Ball has written a superb book on Spanish futbol. The title illustrates the theme of his work, morbo being an untranslatable term meaning rivalry, although that doesn't really capture the essence. On the other hand, after reading his book, you'll have a better understanding of it all. Well written with a decent but not overbearing sense of humour, this book is easy to read, and you won't be able to put it down. Not surprisngly, he has a slight pro-Basque outlook, since he lives in San Sebastian, but not to the point to be uncritical. Naturally, major chapters on Real Mardrid and Barcelona, but he also includes Real Huelva (Spain's first club), Athletic de Bilbao, Sevilla etc. He probably could have added 100 pages and covered areas left out, such as Galicia (Deportivo, Celta), Valencia, Canary Islands. This is really the only weak point. He wraps it up with a section on the miserable failures of the national squad, and touches on the influence of foreign players.